ACES partnered with Bogh Industries, experts in burners, ovens, heat-treat and mechanical engineering, on major design revisions to an oven in Chandler, AZ. This machine is part of a production facility which extrudes billets of aluminum for the aerospace and automotive industries, and other industrial applications. “Before” picture inside the oven’s control cabinet shows multiple relays down the back and the sides, and fuses everywhere. Covers didn’t fit over the wire trays because there were too many wires. The $400,000, 50-foot long oven was only two years old, but had never worked smoothly. It was unresponsive and when it faulted the HMI wouldn’t notify the operators what the issue was. Worst of all the temperature was inconsistent, with variations of up to 15 degrees. Extensive modifications in mechanical design by Bogh Industries and controls design by ACES turned this oven into a lean, clean, heat-treat machine. When Niels Bogh of Bogh Industries made his initial inspection of the oven, he found that it was a uniflow design, with air entering from both sides and returning at the top. Every few minutes the oven would reverse airflow — and during those times the customer was seeing temperature spikes. The first step was to change the design to a side-to-side flow, with air entering in one side and exiting on the other. This created more uniformity by directing a steady airflow in the same direction throughout the oven. The second step was to change the design within each one of the 12 interior zones. Each zone had two burners operating in one burner chamber with one fan. Two burners would never create the kind of uniformity the client needed, so the new design included only one burner per zone, and the controls were revised so one thermocouple now controls one recirculation fan and one burner in each zone. The third step was to move the position of the burners from the top of the oven to the side of the oven. During a typical Arizona summer, temperatures can reach up to 120 degrees. Even inside a factory, with all of the burners on top of an 12-foot tall oven the ambient temperature became too hot to comfortably service them. In addition, Niels specced out burners that could run with excess air in order to keep the temperatures stable. 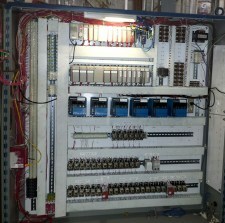 “After” photo shows wires organized and moved into the wire trays, allowing the replacement of covers. Reprogramming to take advantage of the powerful L36 Compaq Logic allowed for the removal of many relays and fuses. 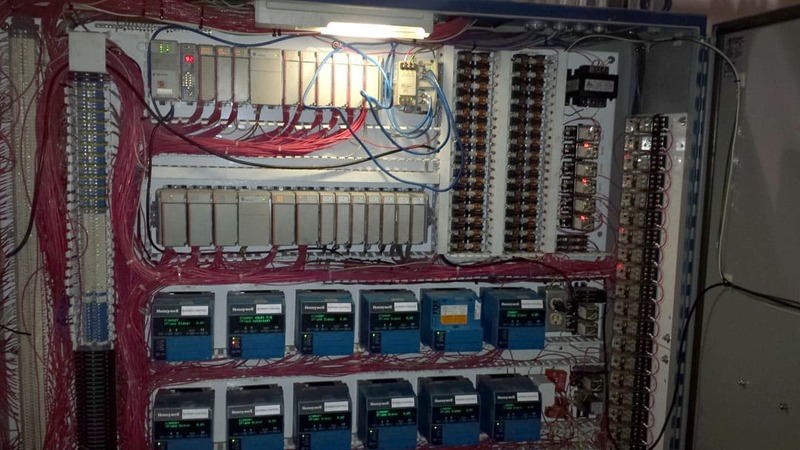 When Robert Duren, the ACES controls engineer reviewed the original oven controls, he found a rack and a remote rack containing an L36 Compaq Logic, which is a powerful modern PLC. However, the addition of 17 expansion cards and almost 90 relays meant that the controls design wasn’t taking advantage of the robust hardware. There were also too many mechanical interlocks, and connections snaking from the PLC to the terminal block…to a relay…to another terminal block…and so on. In addition the cabinet was crammed with wires and components. The wireways were so jammed no covers would fit over them, and there was no way for a technician to trace out wires for troubleshooting when 100-150 of them were bundled together. 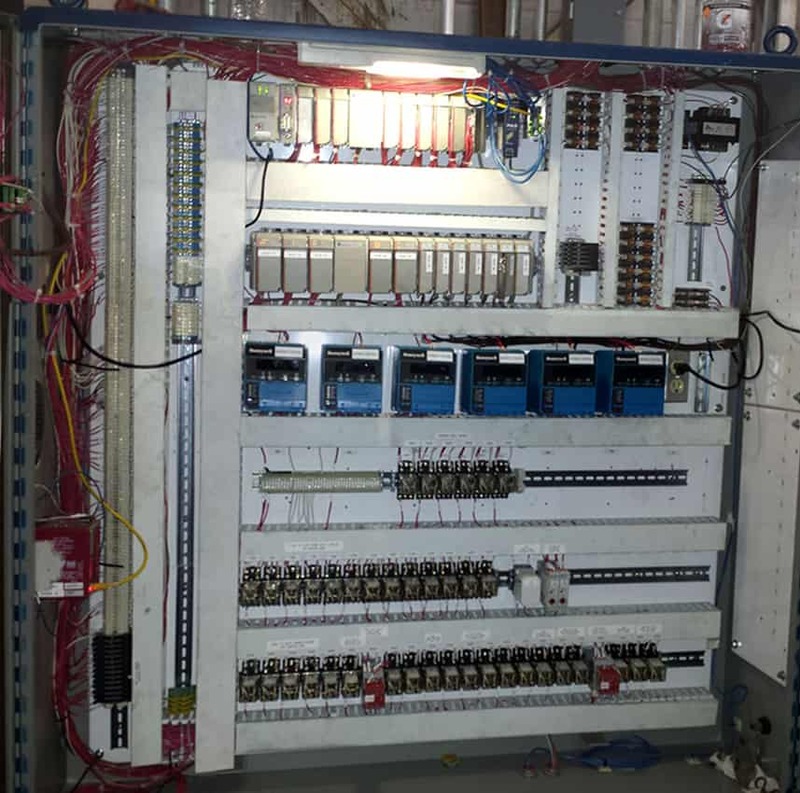 The controls redesign required a whole new set of AutoCad drawings and a new PLC design. After Robert pulled out 90% of the wires and components, and streamlined them according to the new electrical schematic, he removed 30% of the wires, 40% of the expansion cards and 75% of the relays. Before the redesign troubleshooting a minor problem could take up to four hours, because it was almost impossible to trace out the wiring — and the wiring didn’t even match the electrical drawings on file. Now the remaining wires are organized and all components are clearly labeled across both the back plane and on top of the duct cover. In addition, Robert made major programming modifications to add functionality the plant requested, such as showing more status information on the screen and adding more troubleshooting capability. The customer can now force dampers open or closed, put various components in automatic or manual mode and test everything. The HMI screen is now much more responsive: It includes feedback at every stage, and displays three pages of troubleshooting steps — not only to maintenance but to operations. For example, previously if the operators forgot to close the door, the HMI wouldn’t notify them, but now they’ll receive an alert that “All burners are lit, close door.” Red, yellow, green and gray indicator lights show what position the various components are occupying. The final result of the mechanical and controls redesign and re-engineering was an oven with +-2 degree uniformity. Before the redesign the variation within the 8-foot-long supply duct was up to 15 degrees. Afterwards it reliably runs at about 1 degree variation. The ability to add excess air supply means the extruded aluminum soaks out at +-2 degrees. The customer is thrilled that this oven they made such a large investment is running great. It finally works consistently and accurately, and will be a reliable producer for the next 20 years. When it comes to optimizing the delicate temperature range inside a large oven, a synchronicity between mechanical and controls design is a must. Whether your oven needs a tune-up, an overhaul or you’re planning a completely new installation, give the dream team of Niels Bogh Industries and ACES a call.